It is hard to get a real sense of just how big and impressive these things are without actually being there and seeing them for yourself. Mr. LH had been itching to take everyone to the Great Sand Dunes. He visited it as a child and was impressed by it. Now he wanted to share it with the "Pickles". It was easy to choose it as a destination for our whirlwind weekend getaway. The Great Sand Dunes Visitors Center has restrooms and water fountains. They also have a nice little museum area with hands-on activities, a gift shop and an outdoor patio area. We thought it best to try to hit the dunes early in the day and explore the museum area afterwards when the sun was highest (and the sand was hottest). You can get a smooshed penny here! There are restrooms closer to the parking areas and the dunes that also provide outdoor showers/foot washing areas (you might find you really need it if you play in Medano Creek when the water is low). 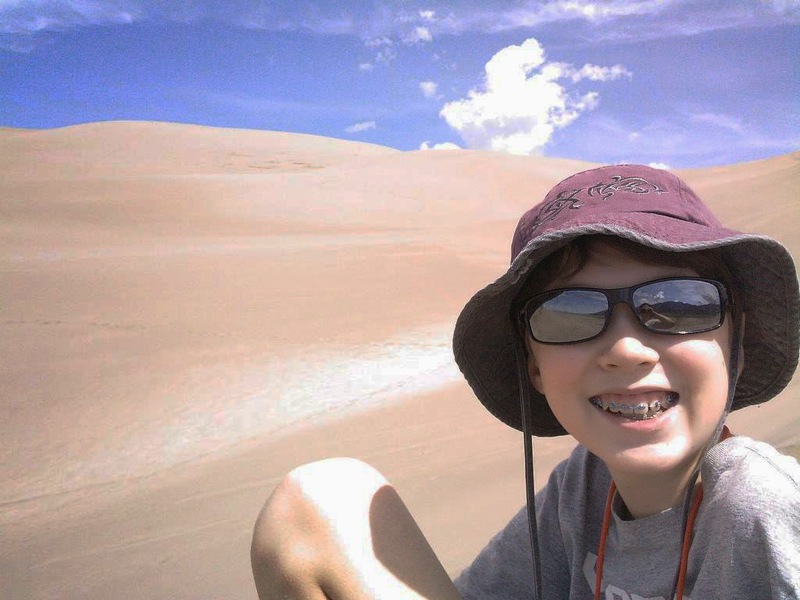 The Great Sand Dunes National Park website has a list of some things recommended for you to pack for your visit. I've added my own comments based on our trip. Shoes – The sand gets extremely hot on sunny summer days and will burn the soles of your feet if you don’t have a barrier between your feet and the sand. You can wear flip-flops, but it will be hard to walk in them. I know. I tried. You can wear sandals, but the hot sand will still scorch your feet. You can wear water shoes, but if the sand gets inside them, it will rub your skin raw. As odd as it may seem, it is probably best to wear regular shoes or hiking boots and socks. With that said, if you happen to be visiting on a mild winter or autumn day when the sand might not get so hot, go ahead and wear sandals. Clothing – Check the weather and plan accordingly. Generally shorts and a t-shirt during the summer months. Long sleeved shirts and pants on windy days (to keep blowing sand from stinging you). Storms can blow in fast so keep that in mind as well. Having a small pack with you that has a light raincoat in it might be a good idea. Water – Remember, you’re at 7,500 feet – drink! You can refill your bottles at the welcome center. It got unbelievably hot on the sand and you will get tired and thirsty hiking up those dunes. Hey, you can always make a crochet water bottle holder to stash your water bottle in. That's what the "Pickles" carried their bottles in. Sunglasses or Goggles - sunglasses worked fine for us, but had the sand been blowing, I can see where goggles would have been preferred. Sunscreen - Okay, one of the first lessons we learned in Colorado was to always wear sunscreen when outside. With that said, basically the Great Sand Dunes is like visiting a beach without the water. Put on sunscreen. Bandanna to cover face - We didn't need one (though as mentioned before the winds were fairly calm at the time). A bandanna doesn't take up much space and it wouldn't hurt to have one with you. Stash one away in your pack. We did, however, take a lot of hats. Mr. LH zoomed in as much as possible to take this picture. That's me and The Boy sitting on the ridge at the point where I wimped out. Camera – It is recommended you leave the point-and-shoot and the SLR cameras at home (blowing sand will seize the lens). Contour and GoPro cameras are best suited for the Dunes. That said, I kept my point and shoot camera in a ziplock bag while we were on the dunes themselves. It was harder to use, but it was either that or go without the camera. I've had sand ruin a camera before and I didn't want to have that happen again. We also used our phones to take pictures. The Girl and Mr. LH were the only two in our group to make it to the top. I wimped out halfway up. The Boy decided to "keep me company". Sandboard or Sand Sled - rentals are available at Kristi Mountain Sports. The price was very reasonable. We made reservations and pre-paid for one regular sized sand sled online (getting more sleds would have meant more weight to lug up the dunes) and since Kristi's isn't open on Sunday (when we needed the sled) we were able to pick up and drop off at the Alamosa Welcome Center in town. They say the best time to visit the Dunes is in late May or early June when the snow-melt turns Medano Creek into something resembling a shallow river. It was late July when we were there and a smidgen of water was still running through, although that could have been the result of recent storms that moved through the area. It was nice after coming off the hot dunes to soak our feet in the cool water. Visit the Great Sand Dunes National Park website.